How AcuRest Devices, Anti Snoring Device Work? The AcuRest™ devices utilize the science of Reflex Therapy so that when the thumb and index fingers are gently stimulated in a specific way three important changes will occur. Blocked energy is released which allows the healing Chi to flow to the areas of the eyes, nose, throat and lungs. AcuRest™ supports restful sleep allowing the body to replenish the Chi energy that is essential to the healing process. The idea of applying pressure or stimulation to energy meridians in our body can be traced back to early in the 6th Egyptian Dynasty (about 2,330 B.C. or over 4,340 years ago). The scene on the left is reprinted with permission from Dr. Ragah Hassan, the President at the Papyrus Institute in Cairo. If you look closely you will see that both the feet and hands are being massaged and a translation of symbols will show that therapeutic massage is being applied. This practice of working with the energy meridians has been refined over the centuries and developed into a number of different therapies. The purpose of these therapies is to stimulate the Chi (also known as Qi or life force). 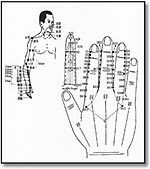 Chi runs through 12 main meridians and extensively through the hands and fingers. Traditional Acupuncture, for example, divides the body's nervous system into the sympathetic (yang) and parasympathetic (yin). During sleep or rest the parasympathetic becomes active and tries to build up our body's reserves of (yin) energy. This yin or nourishing energy is depleted when our sympathetic becomes over active due to long periods of stress of any kind. When these two opposite parts of our nervous system are in balance and our reserve of yin is plentiful then we enjoy good health and vitality. Illness and weakness appear when the body is not in balance. The traditional Eastern approach of treating the patient holistically, rather than prescribing drugs that target specific symptoms, is becoming more widely accepted among Western doctors. Much of this traditional approach to medicine is based on the understanding that because everything is inter-connected, when you stimulate certain parts of the body, the meridians open up and energy flows, allowing the body to self-heal. WHAT ARE THE MERIDIAN LINES OF ENERGY? 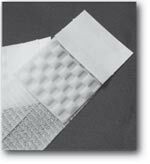 Many years ago teams of medical researchers from different countries in the world including the USA, Canada, France, Scotland, Great Britain and Israel used electrodes and other methods to identify, track and map electrical energy in the human body. They observed that electrical energy runs through the body in predictable lines and called these lines of electrical energy - meridian lines. What they discovered using scientific instrumentation affirmed what has been known in the East for thousands of years. They also found that if you press or massage certain points in any one of these lines of electrical energy it will affect (and can bring balance) to that line of energy. When these lines of energy become congested, wellness is often compromised. It was also discovered that endorphins (natural pain suppressors and muscle relaxants) could be released into a specific part of the body, by pressing or massaging the meridian associated with that pain or dysfunction. a) Blocked energy is released which allows the healing Chi to flow to the areas of the eyes, nose, throat and lungs. b) Natural endorphins are produced which relaxes the tension that creates snoring. c) AcuRest™ supports restful sleep allowing the body to replenish the Chi energy that is essential to the healing process.